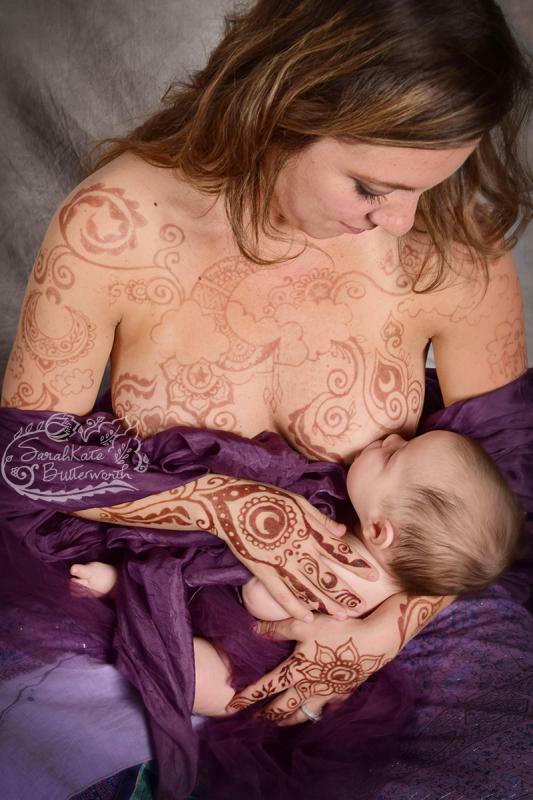 This sweet mama drove up from Denver for breastfeeding henna. 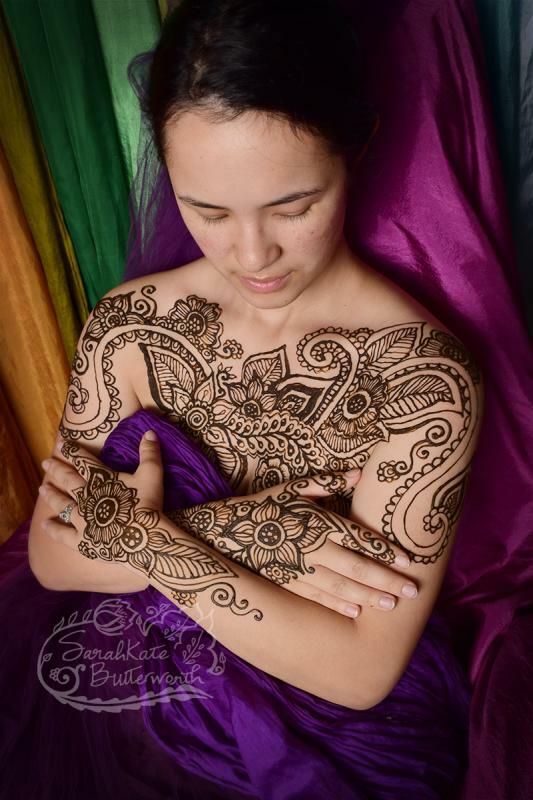 Her henna design incorporates lots of flowers and vines. She returned to the studio a few days later with her daughters for nursing photos. I loved the rose headbands she brought! We snapped a few precious photos of them inside and then went outside to sit among the flowers. Just beautiful! Such a joy to see the loving bond between this mother and her daughters. Here we are out in the field... This photo was taken by my beloved husband Rob who assists in the creation of this art. I am the artist who loves to compose the shots & push the silver button on the camera, he has the technological insight and photographic know-how to help find these nature scenes & light them. I love working with him as a team! 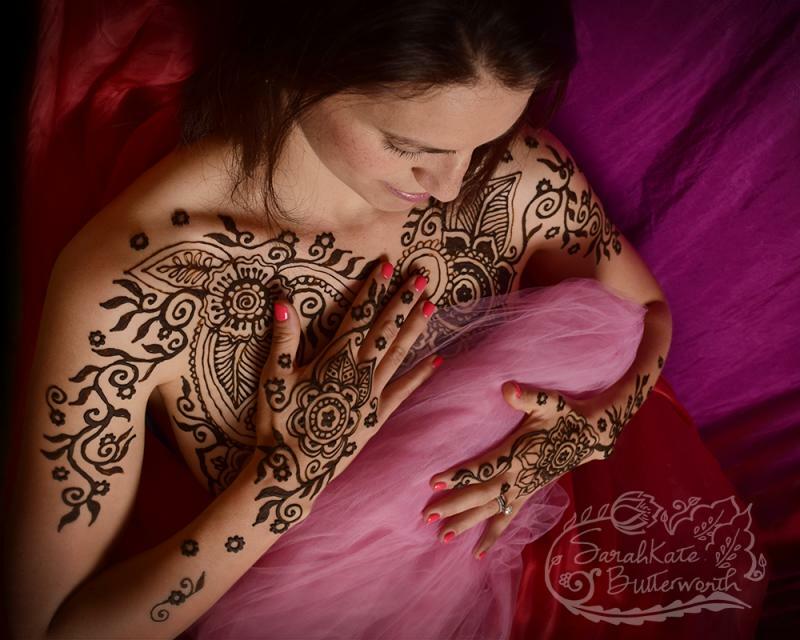 I met Julie through a prenatal henna & yoga art project that I did this Spring. She chose the incorporate a monkey in her design, since it is the year of the monkey. Photos were taken just a few days later at sunset (along with some in the yoga studio as part of the project). It was so beautiful! The first few green leaves were coming out.... and Julie is just glowing in the light! Hi everyone, I am very happy with my latest art project: Mama Henna * Mama Yoga. The projected started as a conversation at the mama'hood talking about how beautiful a whole class of pregnant mamas doing yoga, covered in henna would be. There was a false start before we found the right ladies and the right leader... When we found the right teacher, the rest fell into place, Faith Davis was that teacher. 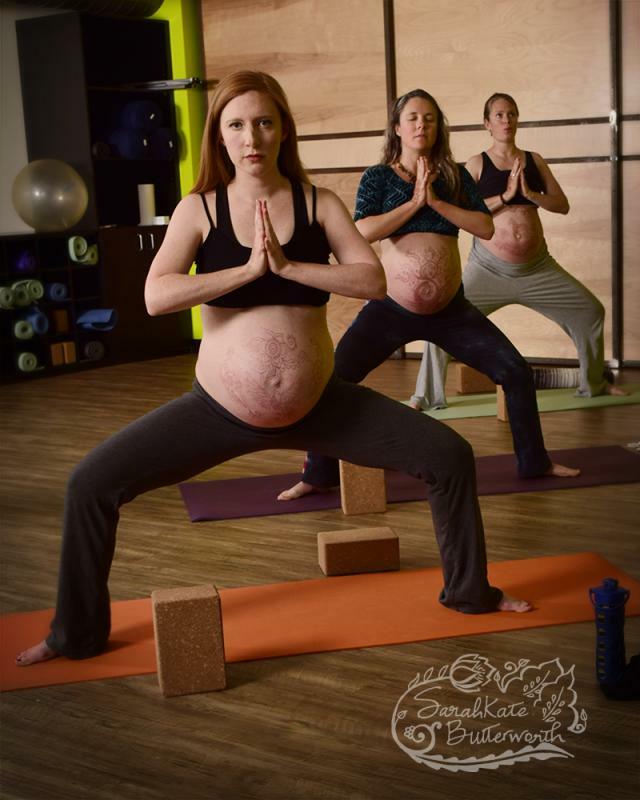 A couple of days before the class, all 5 beauituful mamas made their way to my studio, each had something unique for this pregnancy, represented in their design. 5 yoginis, seemed like the right number, but in the two days while hte henna was darkening, before the photoshoot, 2 of the mamas went into labor, so we had 3 mamas for the actual yoga project. But what a trio! Rob and I worked as a team photographing these lovely mamas-to-be, in what ammounted to a prenatal yoga class, with Faith (a yoga teacher at mama'hood) leading these women through an hour class.
."And as we stretch up we are making space in our bodies for our babies and also in our lives..." It was such a gorgeous flow to witness. I was moved by the experience, witnessing the inner strength of these women, being able to really look at them, their dillagence, their love for their babies... As an artist seeing is so important, and the opportunity to witness the living art of henna in the flow of yoga was a dream come true. 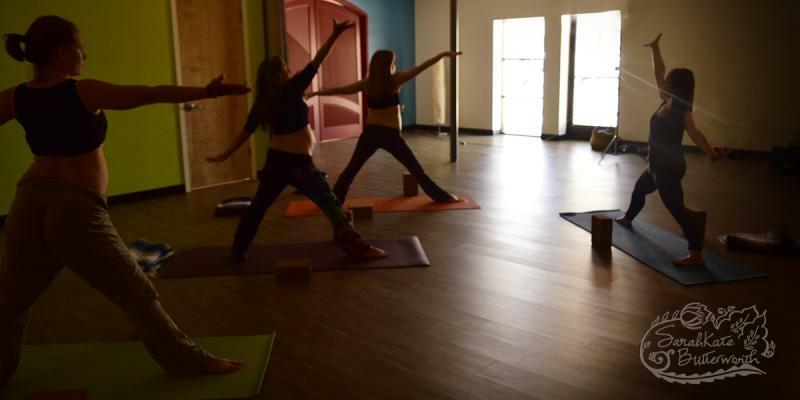 We did the yoga and photos at the Boulder Mama'hood, which has a ton of great classes and groups for pregnancy, postpartum and breastfeeding. clothing and other great stuff, there are great people!! The women at the Mama'hood alone will make you glad you came. I would like to give Faith a special thanks, she really helped make this happen, and her class was heavenly, what a beautifully calming, wise woman! New Volume of Art Released! A labor of love! I am very excited to share this work with you again this year. 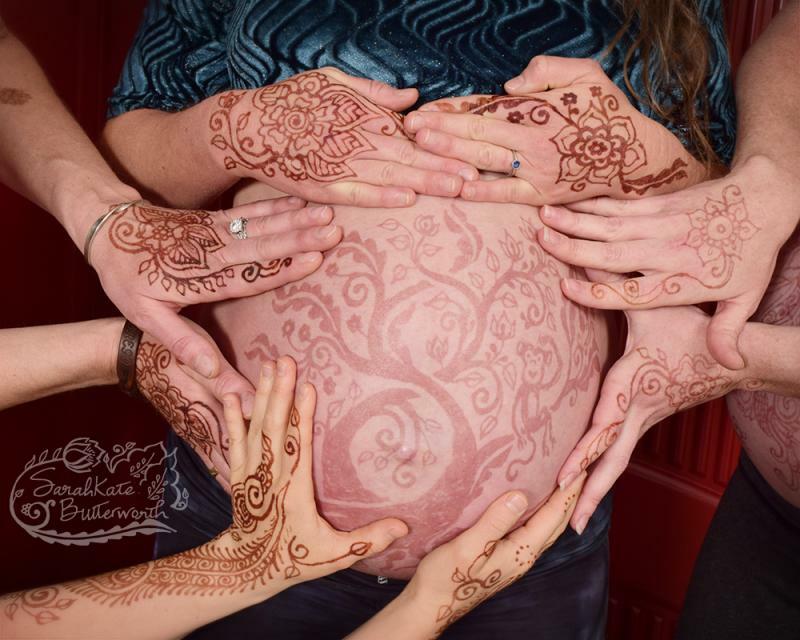 Blessed Belly, Blessed Baby: Honoring Motherhood with Henna Tattoos Volume 6! It feels very special just to have completed yet another of these volumes of love, this one has something I would have never even dreamed about when I started this project, my daughter being our cover model! 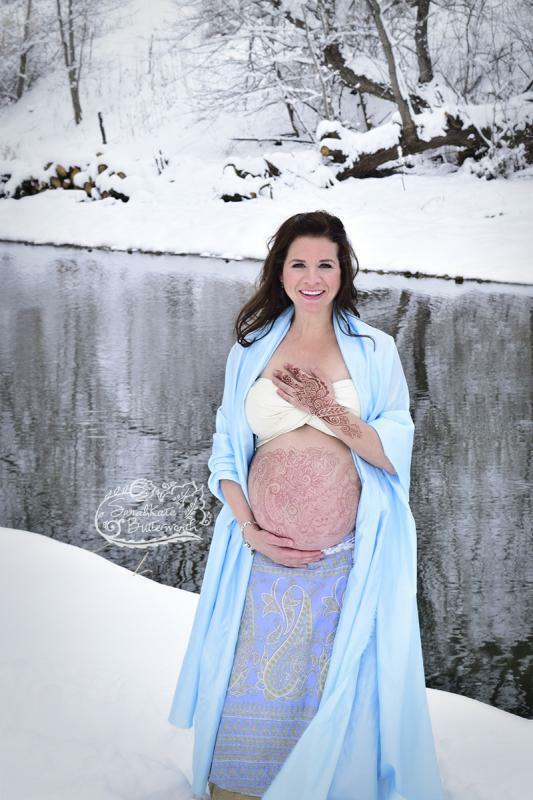 She is so strong and sweet, with pregnant with TWINS at 39 weeks! We drove through the night, leaving a couple of days early because she still hadn't given birth. 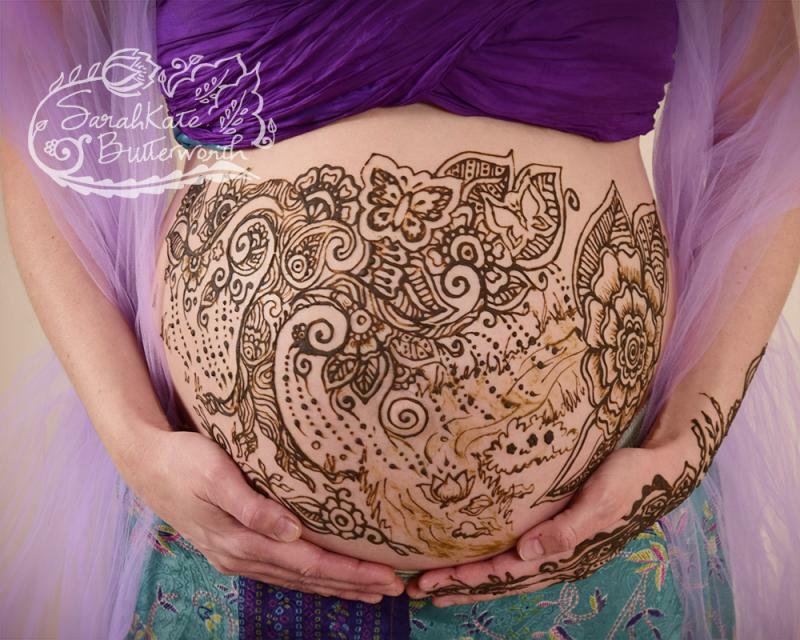 It was a dream come true to be able to paint her rather large Twin Belly and give birth with her henna so dark adn beautiful! If Aleah's appearance wasn't enough, this sixth book in this series of artistic table top books, features a bright and beautiful crop of new beautiful pregnant / new mothers, showing off my (SarahKate Butterworth’s) inspired henna designs. 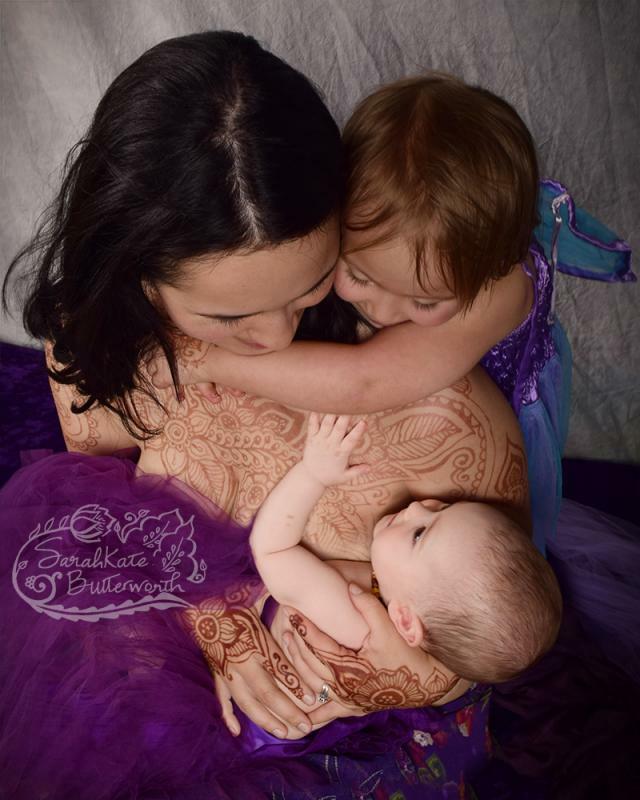 This year I was blessed with 72 stunning new mothers for their 2015 celebration of birth and motherhood. 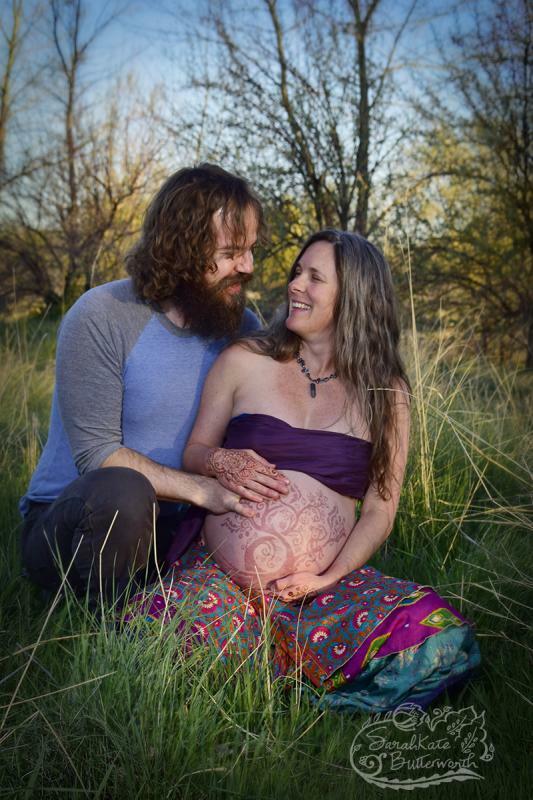 The honest, glowing mamas exude, "the pregnant goddesses" spirit in color, nature and a closeness to the Mother which births us all. Sara asked for a henna design incorporating a willow tree, a river and a lotus. I loved what we came up with! When this Thornton mama came back for photos, it was just finishing up snowing! It was coming down so lightly that we went ahead with the photos. I absolutely love how peaceful everything is when covered in snow. 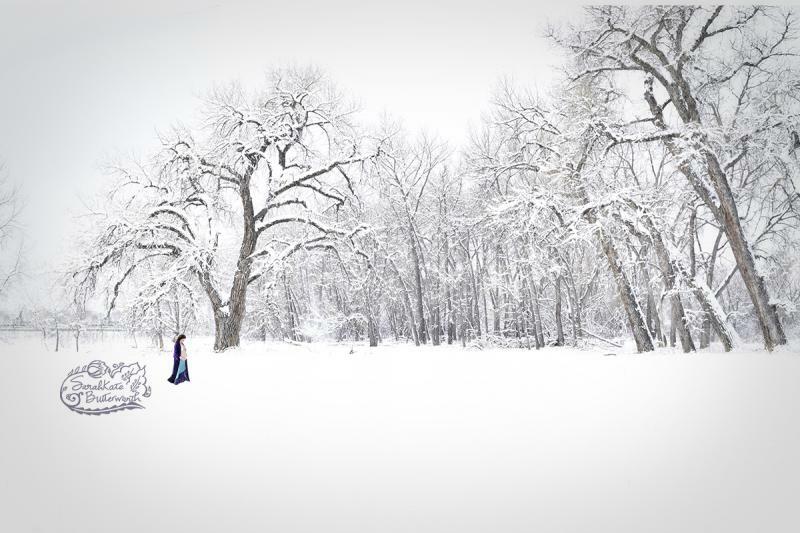 March is the snowiest month in Colorado, after all. Sara stayed warm with her coat between shots. 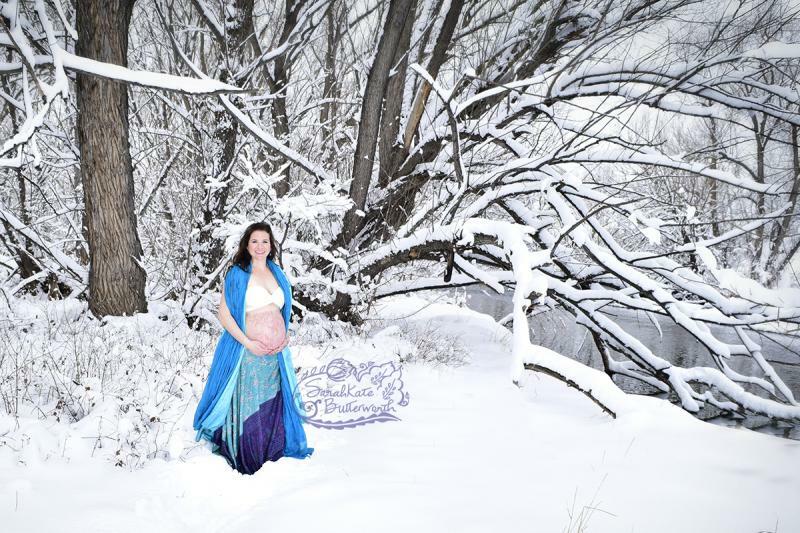 Because we had a river in the henna design, we made sure to photograph her next to Boulder Creek as well! We also went outdoors! It was a beautiful, warm spring day. 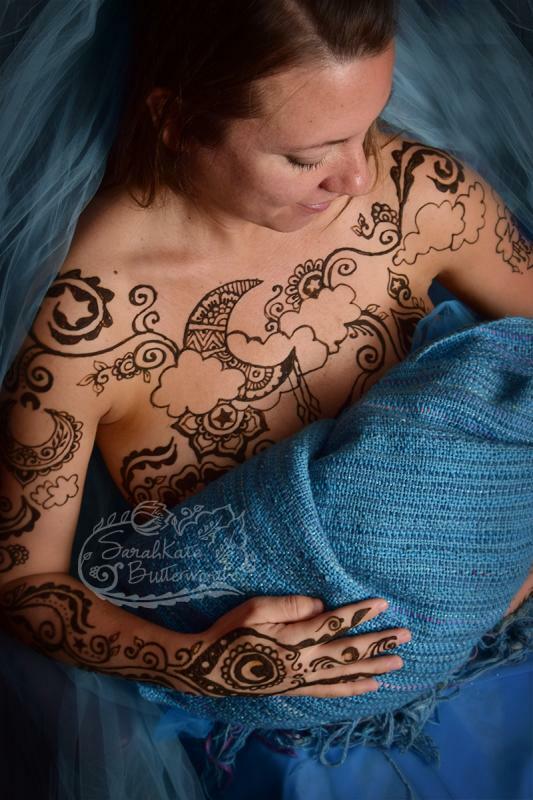 I am continuing to work on my breastfeeding body art project, which has taken several years and involved over 60 women. I happily plan to publish a book with this collection this year! This beautiful mama drove in from Denver and requested a henna design with a theme of moons and her daughter's name: Zoe. I put in several moons, on her shoulder and hands... see if you can find them all! The henna application took about 2 hours. Lindsey returned in a few days with her daughter for nursing photos, and surprised me with an enchanting collection of delicate flower crowns for her baby girl! She looks so adorable in them.... What a joy to capture this loving bond between a mother and her child.